During the Christmas period once again, Christ Church St Nahi’s looked serene and beautiful. The decorations and Christmas trees were greatly enriched by the vibrant display of red poinsettias donated by people across the parish in memory of loved ones. The Chancel Guild would like to thank everyone who participated in this scheme. A sincere thank you to all who helped decorate both Churches for the festive season and also helped with the ‘tidy up’. Easter is looming! 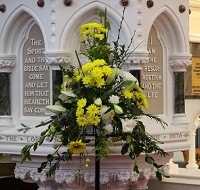 We will be decorating both Churches on Saturday 21st April at 10.00am for services on Easter Sunday. We welcome anyone (with open arms!) who will be available to help on that morning. No experience needed! Any greenery from your garden will be much appreciated. Many thanks to all for your help and support throughout the year.